Lovely and romantic, this popular honeymoon destination condo overlooks Bali Hai and Hanalei Bay. The room boasts a comfortable, four poster king size bed with designer bedding, large remodeled bathroom, a small sofa, and large slate covered private lanai for sunset viewing. 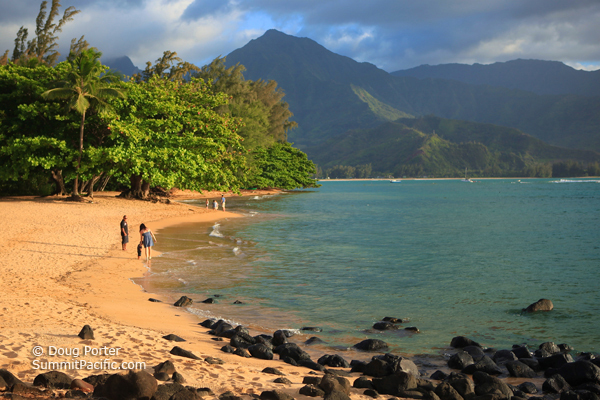 Enjoy the views of the waterfall filled mountains to the west and see the boats come into Hanalei Bay. This large 450 square foot unit is air conditioned, is a non smoking unit, no pets allowed and has recently been repainted and redecorated. There is a mini-fridge, coffee maker, 32-inch flat screen TV and beach toys for you to enjoy. A maximum of 2 people please. Let me start with saying that my husband and I stayed here last year and loved it so much that we came back this year and loved it just as much and so are booking it again for next year! 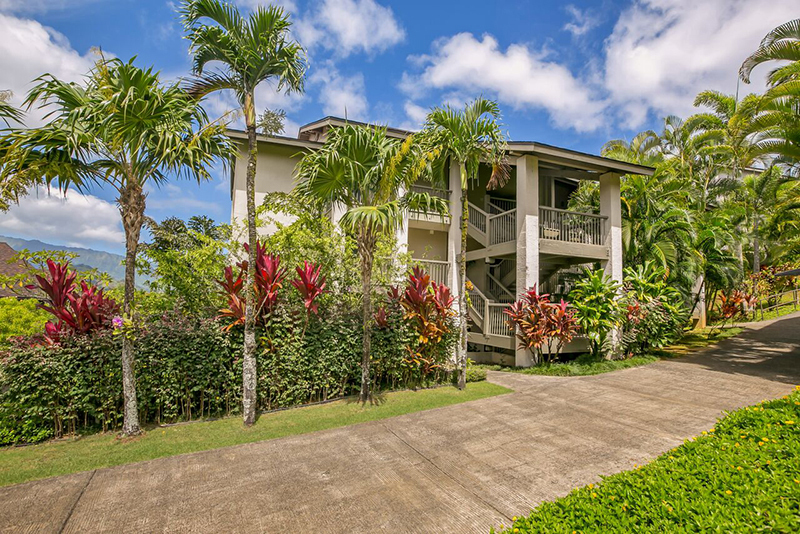 We love Kauai, the north shore in particular, and this condo at Hanalei Bay Resort specifically. 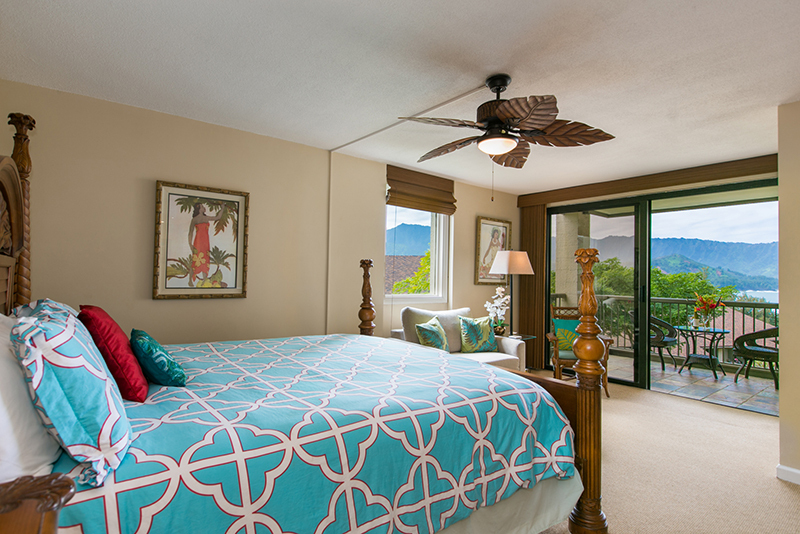 Hanalei Bay Resort is a tropical paradise, and this particular unit is beautifully decorated, updated, with attention paid to every detail. The view is no less than spectacular, even better than the pictures reveal. 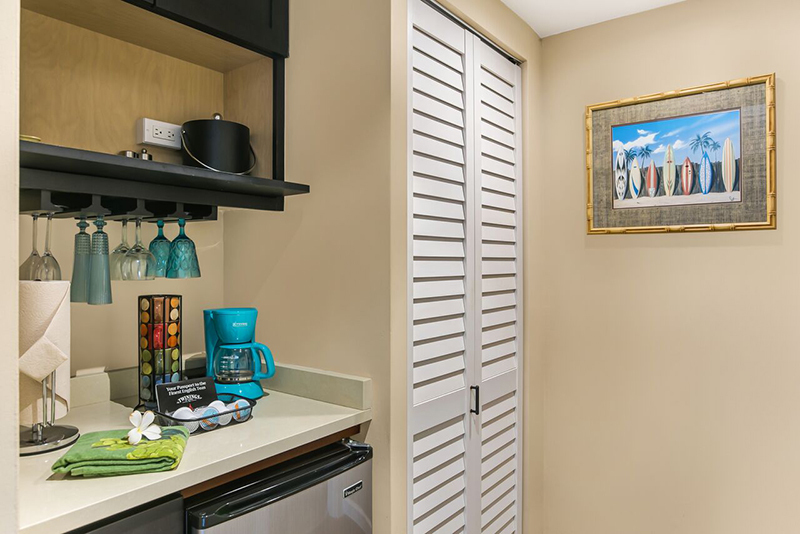 The kitchenette was perfect for having a light breakfast and coffee each morning on the lanai while watching the beautiful sunrises, and we used the bbq grills that are located close by, enjoying dinner on the lanai while watching the amazing sunsets. The Happy Talk Bar and Grill is now open which we also enjoyed and found to be a great addition. The owner, Joan, is very nice to work with, very welcoming, and prompt at answering any questions with lots of helpful advice as far as what to do, where to eat, etc. 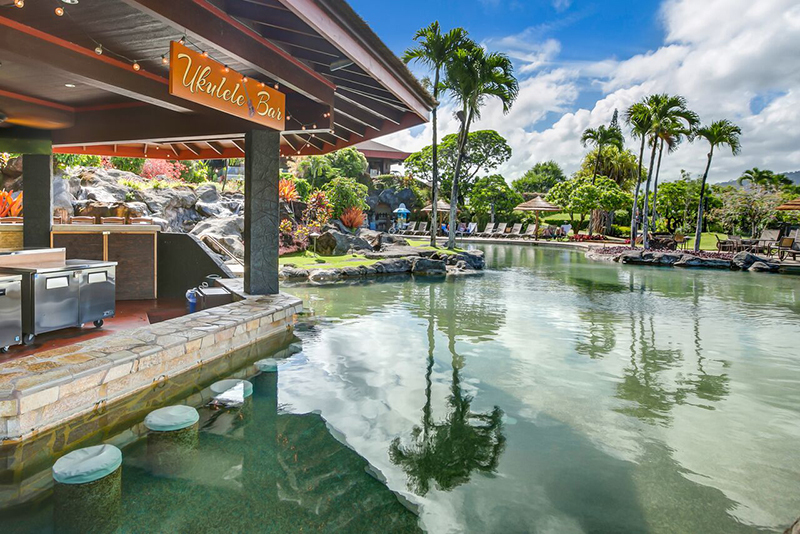 The staff at Hanalei Bay Resort are also very friendly and helpful, and quick to respond to needs and questions. We enjoyed walking the paths around the property and down to the beach, and the staff is quick to provide golf cart rides on request. All we can say is, we love this place so much that we plan to make an annual return to this beautiful paradise! The first night of our honeymoon was spent at Hanalei Bay Resort. 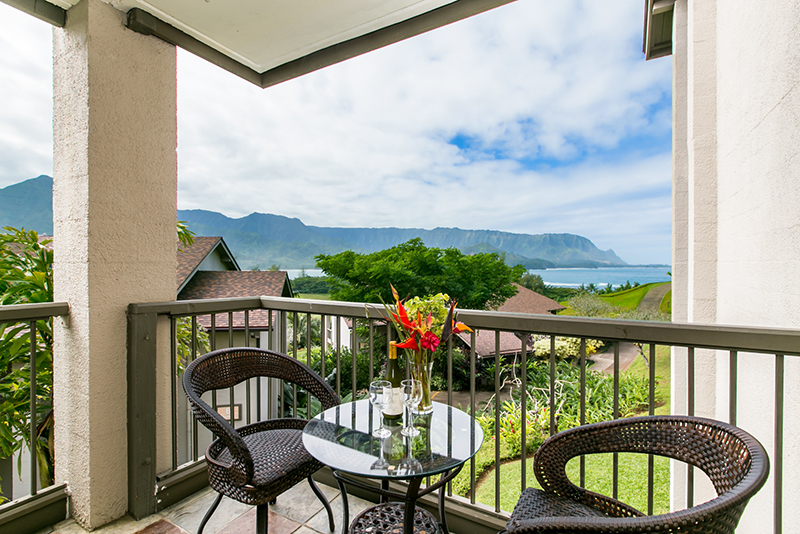 The view of Hanalei Bay is spectacular from the private balcony. Mountains with flowing waterfalls and ocean waves. We watched our first sunset together as husband and wife. So romantic. The room was clean, furniture (King bed very comfortable) and fixtures were like new, and the little kitchenette was perfect. We made coffee each morning, sat on the balcony and just took in the view. So very peaceful. Included in the room were all the makings for a fun day at the beach (picnic basket, snorkeling gear, beach chairs, etc.). The staff was kind and helpful. Really nice and welcoming. Lots of activities going on daily for all ages. The grounds are absolutely beautiful and well kept. The pool is amazing! The owner of the condo is a gem. Such a sweetheart. Greatest lady. She was always available for any questions we had. She suggested places to visit, things to do, where to shop. VERY helpful! The grocery store, shops and restaurants near by were visited often by us. We recommend HBR to everyone we talk to about our stay on the Island. Recommendations would be Jo Jo's Shaved Ice Shack in Hanalei Bay.... we were there twice... gotta have it. Little Thai food place in the complex were Foodland is. Yummy. Rent a car (or jeep as we did) and drive north up the coast. Beautiful swimable beaches. Take a helicopter tour. Worth it! Go see the HBR concierge at the beginning of your stay, she/he will arrange all your activities. The pictures and description for this listing don't do justice. We can't wait to go back! Thank you so much for letting us share your condo for a week. The entire trip was just breathtaking. We wanted some relaxing time so we didn't have much things planned. One day I went diving and sent Debbie over to the St. Regis for a beach front massage in their cabana along with a whole day of spa facility usage. The other day, we took a helicopter ride around the island and ended the day with a dinner show at the St. Regis. Other than that, we pretty much just lounged around the pool and in your apartment. Your apartment was amazing. Honestly, the view from your condo was just as good, if not, better than the view from the St. Regis. One of my friend, who stayed at the St. Regis over Memorial weekend, recommended me to watch the sunset from the St. Regis bar, but in retrospect, I think watching the sunset from the bed of your condo looking out was a much better option! Debbie and I are already looking into when we can to buy tickets again to re-experience the R&R from your condo. Stayed in paradise. The condo overlooked the bay and the mountains. It is privately owned unit 4221, would highly recommend it. Had all the amenities (snorkel gear, beach equipment, cooler, umbrellas, etc) and well maintained. It has been 3 weeks since our return from paradise and those stunning views of Bali Hi are still entrenched into my mind. (On the first day we had double rainbow extravaganza right off our lanai) We would like to thank you for a beautiful stay in 4221. This was our fourth visit to Kauai and by far this trip was the best. HBR is exquisite with the beautiful views and fabulous pool. We would love to return soon and rent the 2 bedroom unit with our sons. 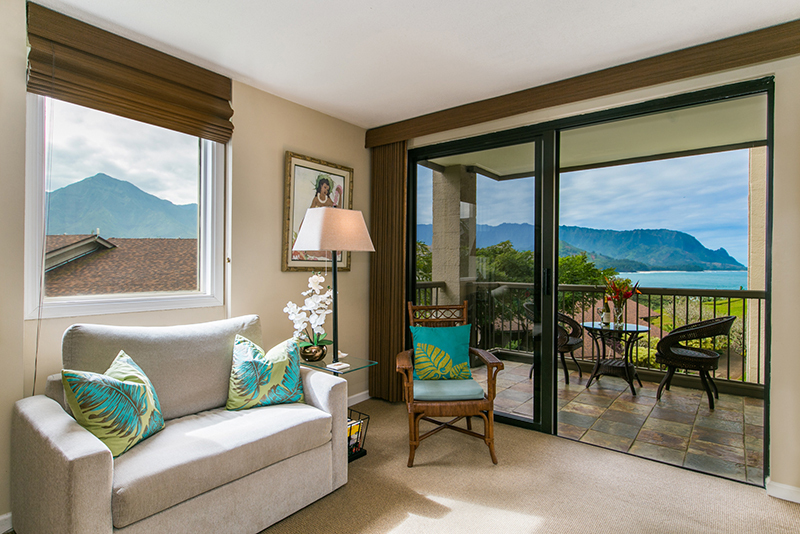 We were lucky enough to find Hanalei Bay Resort and Joan's beautiful condo #4221 for our recent first trip to Kauai. It is now hands-down my favorite Hawaiian destination. One of our top requirements when planning this trip was to have an ocean view. We arrived late on a pitch dark night and had no idea what our view actually looked like. 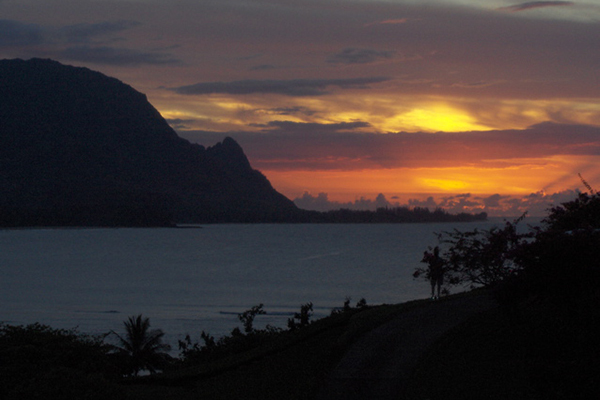 Early the next morning we awoke to a beautiful sunrise over Hanalei Bay from the Lanai. That week we had spectacular sunsets and sunrises and even a picture perfect rainbow all from the comfort of our beautiful room. 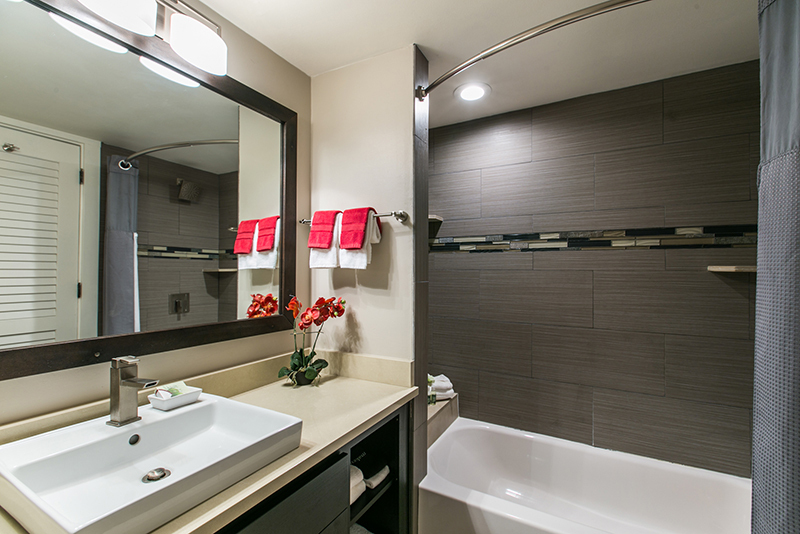 The condo was recently updated and is tastefully decorated, making you feel comfortably pampered. The grounds are beautiful and the short walked down the trail to the beach was a delight on our first morning. Half the pictures we took in Kauai were from our deck or on the grounds of the resort because it was so spectacular. We felt we had landed one of the best locations on the island for our stay. Joan was an amazing resource for things to do on the island and I felt blessed to have a knowledgeable contact to help make our visit ideal. She also provides her guests some snorkeling gear, boogie boards, beach towel sand chairs so we had everything we needed for our daily excursions. With a week filled with power hang gliding, swimming with the giant sea turtles at Tunnels Beach, kayaking the Wailua River, swimming in a mineral pond at the base of a waterfall, snorkeling the south shore and hiking to nearby Hideaway Beach and Queens Bath we felt we had the perfect vacation. We didn't want to leave. We will definitely return to this wonderful condo and will recommend it to our friends and family without hesitation. Thanks for the great Condo. We had a terrific time and your unit worked out perfect. We will certainly call again and look forward to returning to such a great place. The entire staff was very accommodating and friendly. I will recommend your units to all our friends and I hope to return soon. We loved our time in your condo. It was way more than what we expected. We couldn't believe all the sport equipment you had for our use and the kitchenware. We really enjoyed the terrific view of Bali Hai, seeing the Nene wander through in the morning and watching the sunsets. We also made use of the resort's BBQ and the pool in your area. Joan, we will recommend your outstanding condo to anyone looking for a relaxing, beautiful place to stay in Princeville. we stayed in unit 4221 and our unit was beautiful ,well decorated and serene , the view was amazing and the people at HBR were kind, thoughtful and very friendly, we loved it and hope to return! What a fantastic place! 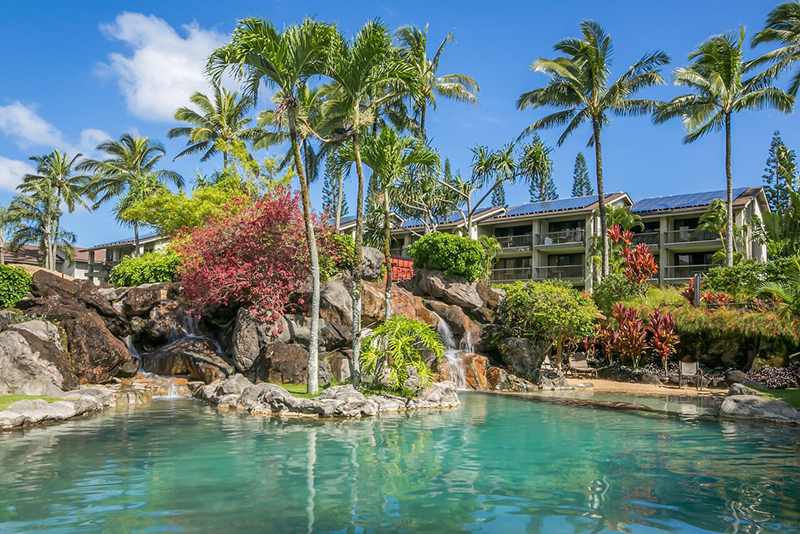 We are absolutely in love with Kauai and your condo is very nice and a great location! Thank you so much for all the help and suggestions for things to do. We did go to the Canyon which was absolutely incredible! We saw a Luau and did a dolphin excursion with Blue Dolphin, saw whales and dolphins and got to swim with sea turtles on three separate occasions! How lucky are we... This definitely was one of our most memorable trips (and we've traveled quite a bit together) and we hope to go back soon. "My husband and I stayed at the resort for part of our honeymoon. We rented room #4221 which is privately owned and operated by Joan. She was fantastic to deal with leading up to our trip and the room itself far exceeded our expectations. 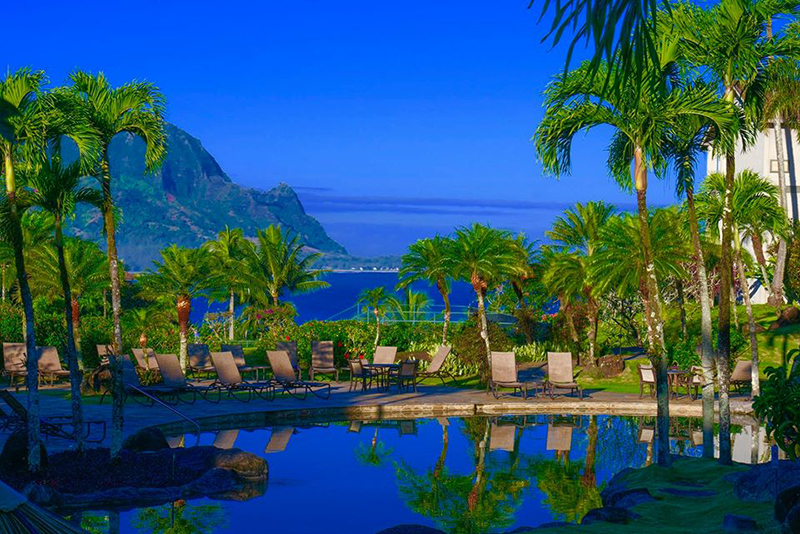 We had a beautiful ocean and mountain view along with the privacy of being towards the back of the resort." The setting is magical. 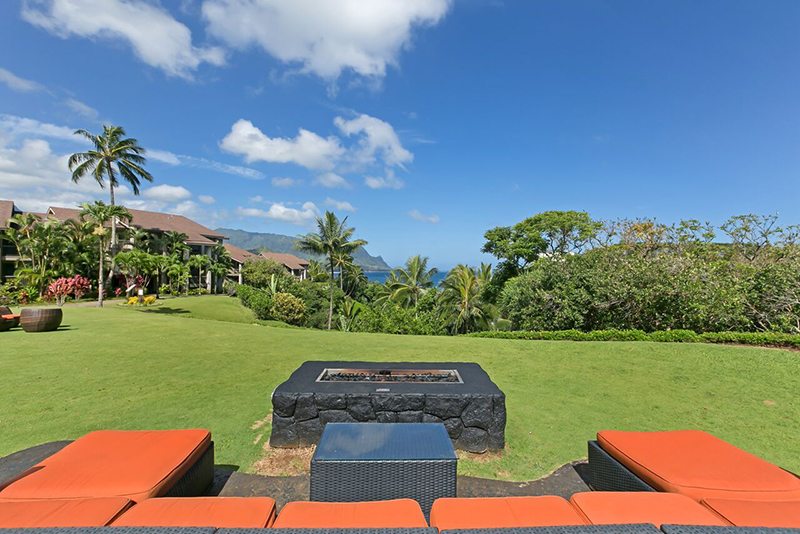 You are perched up on a bluff overlooking Hanalei Bay and look out on crashing surf and Bali Hai in the distance. The condos themselves are perfectly sited and the grounds are immaculate. We had the good fortune of staying in one of the properties owned by Joan Bettencourt, 4221. In addition to being nicely decorated, there were lots of extras available to us that were thoughtful (e.g. tennis rackets, boogie boards, DVDs, CDs, etc.). The pool and spa are beautiful. This is certainly a special place for us and we hope to return."